The mission is simple: serve rapturous, enticing music that guests will want to return to time after time. South African Steinway artist, Christopher Duigan, and American violinist, Joanna Frankel, play the Violin Sonata in E minor, K304 by Wolfgang Amadeus Mozart. South African Steinway artist, Christopher Duigan, and Spanish saxophonist from Barçelona, David Salleras, play selections of music written by Christopher Duigan. Salleras plays Selmer saxophones with Vandoren reeds. The MUSIC REVIVAL story was featured in a blog by Greg Sandow. Greg is is highly regarded and followed blogger on the future of classical music, worldwide. He also teaches at Julliard in New York, so we amazed that our story about our musical 'goings-on' in KZN-South Africa, are of interest to him! In March 2010 Christopher Duigan was invited by the world's premier piano manufacturers Steinway and Sons to join their International Steinway Artist Roster recognizing his calibre of performance, artistic commitment, profile as a musician and his contribution to music in South Africa. The sixth pianist in South African history, as a registered Steinway artist he joins an exquisite circle of renowned musicians including Franz Liszt, Richard Wagner, Arthur Rubinstein, Vladimir Horowitz as well as contemporary International Artists Evgeny Kissin, Martha Argerich, Lang Lang, Keith Jarrett and Diana Krall. Pianist, Steinway artist and musical entrepreneur, Christopher Duigan, will perform Beethoven's Piano Concerto No 5, the Emperor, with the KwaZulu-Natal Philharmonic Orchestra (KZNPO) in Durban on 10 March. As producer and impressario, Duigan's Music Revival 'label' has become synonymous with festivals and concert series from Hilton in KZN to Franschhoek in the Western Cape. These entrepreneurial enterprises are clearly driven by natural instinct, personality and creative flair. Has this always been the case, or did it perhaps, in part, originate from a 'survival instinct'? Survival certainly was the initiating factor. After returning from studies overseas and making a decision to pursue my career as a performing artist in South Africa I set about chasing as many engagements as I could. Inevitably there were gaps between these performances. I was also finding myself quite alienated from the people around me, in my own community, who knew what I did but had little opportunity to hear me play, and had little or no understanding of what I did. It seemed obvious that I should start promoting my own performances and should do so in a way that I could start to integrate with them as a performing artist. Yours are innovative presentation and programming, often with a cross over element. Please give some examples of recent projects and ones that you feel has been most successful, from both the performers' and audience's point of view? I am inspired by the piano as an instrument. It is such a versatile and complete entity. I have always had an interest in different genres of music, classical and popular. In the process of approaching 'new' audiences and armed with a variety of music I also realized that some 'popular' music, while skillfully written for the piano, offered an easy approach for some. Once comfortable with something we know or recognize, we feel like we 'belong', we can own the experience ourselves, and will be more receptive to something new. On another level the juxtaposition of different types of music speak to one another and the juxtapositions inform in an enlightening way. The crossover programmes I present combine short pieces from the classical repertoire with groups of ragtime, tango – nuevo and traditional, jazz transcriptions and film music. In a presentation titled 'Play Piano Play!' for instance, I combine Mozart's Turkish Rondo, the Ritual Fire Dance by De Falla, a waltz by Satie with South American music by Ernesto Nazareth and Astor Piazzolla , ragtime by Scott Joplin and a Gershwin song transcription. Classics that show a variety of piano textures such as a Chopin Waltz, Bach transcription and Moskowski Etude, plus film music by Yann Tiersan or Richard Guinness lead to a finish with a 'big piece like the Chopin Polonaise op 53 or Liszt's Hungarian Rhapsody No 2. Each group of pieces I introduce with something about the composer, the music or style of piano writing to offer insight in to what the audience is listening to. What is your main aim when conceptualizing innovative presentation and programming? I try to imagine the situation from the audience point of view. I work by instinct largely, trying to balance the various energies of the music. The 'familiarity factor', a variety of moods and musical weights are all to be considered and I try to stretch these contrasts as far as I can while maintaining a thread. External factors such as the time of year, time of day, the nature of the venue, the 'complete experience' for the audience and other external factors come into play. For instance a Sunday morning concert in a church will have a different energy to a Saturday evening performance in a dinner venue with food and wine. A programme title also goes a long way to holding these elements together. What's in a brand, or label, in your view? Whether Steinway or Music Revival. A brand leads to expectation. So the Music Revival or Christopher Duigan brand (difficult to separate these now) will offer a certain type of presentation that includes an innovative varied programme, personal interaction with the audience (where possible) without compromising on the best performance. It is in itself a level of reliability and expectation. But this can also be a limiting factor in that one can not easily step out of those boundaries without disappointing. One has to tread, or migrate, carefully! What I have learnt is that each musician is a brand in themselves, something they often overlook. As your reputation grows the audience becomes increasingly aware of your presence and what you have to offer. Publicity material including a good biography, publicity photographs, good website and media exposure go a long way to building this brand – essentially 'a brand called me'. Being linked with a brand like Steinway and Sons is a phenomenal association. Everyone knows Steinway. It is one of the most iconic brands worldwide that stands for classic values, individual artistry, superior craftsmanship and unparalleled luxury. It is where art and design meet; inspiration meets craftmenship. When people who own a Steinway discuss their piano they call it by name – 'my Steinway'. That is the ultimate. What are the criteria or process through which one is appointed a Steinway artist and what in your view, is the significance of being awarded this label? This is by invitation only. Being a Steinway owner is a prerequisite. Obviously one's public profile, performance visibility and artist integrity at an appropriate level are factors to being invited. I received my principal training as a musician and pianist on a Steinway and worked extensively on Steinways all of my career. I simply can not find 'my sound' on any other piano and so being associated with the manufacturer of these inspirational instruments is really a dream come true. Sitting at a perfectly tuned and regulated Steinway is for me an invitation for inspiration. It is of huge significance for me to be invited and be included on a list of pianists that features almost every great pianist of the last 100 years. In addition, not being attached to any educational intuition or having any other external body observe and evaluate my work, personally, this recognition carries immense weight. Your projects often provide a performance platform for young upcoming artists. Who have you showcased in recent years? Being able to share the infrastructure of performances networks I have established with other artists, in particular young local musicians, is something that has given me great satisfaction and I do so with pride. Many of these performance opportunities have been for audiences in smaller centres that allow for freedom and experimentation with new work and provides great performing experience away from the critical ears and eyes of the big centre audiences. Performance experience is invaluable and as they say 'one performance is worth 100 hours of practice'. I have worked with and promoted Durban-born soprano Bronwen Forbay consistently over the last ten years. The very talented baritone Federico Freschi is someone I have worked with extensively on a variety of platforms and I have also created and networked numerous performance opportunities for guitarist James Grace, who has become quite an entrepreneur himself. In recent months I have engaged conductor Alexander Fokkens in a series of performances with the KwaZulu-Natal Philharmonic Orchestra. I am always trying to promote young local musicians wherever possible. The young KZN oboist Maggie Deppe has been a delight to work with in chamber music performances under my banner as has the very impressive violinist Refiloe Oliphant, now a member of the KZNPO. 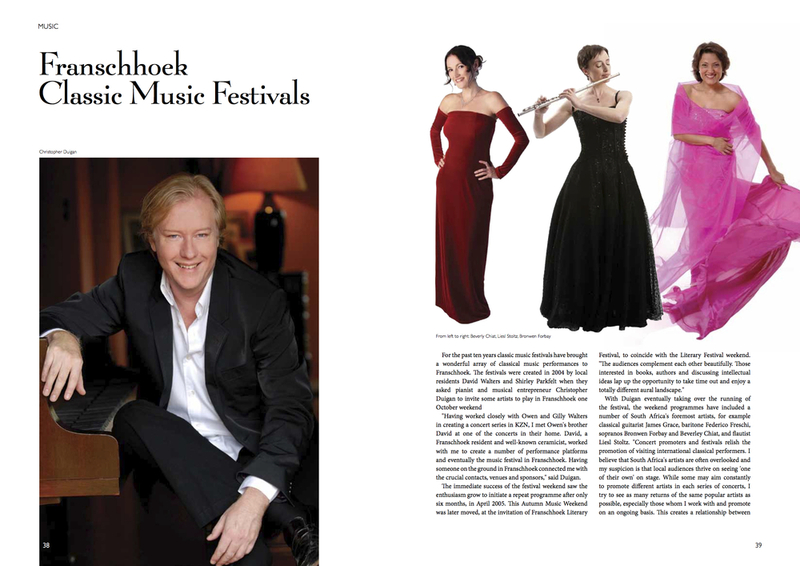 Was the Franschhoek Classical Music Festival your brain child? Or how did it come about and how long has it been running for? Having worked closely with Owen and Gilly Walters who helped me enormously in the early years in KZN, I 'absorbed' much entrepreneurial spirit and endeavour to risk 'new ideas' from them. They even partially designed and built a new home that resembled a small chapel around the idea of hosting my concerts. It was called Wedgewood and the first Wedgewood Nougat (now an international enterprise in itself) was created by Gilly for these concerts. Through them I met Owen's brother, Franschhoek resident and well-known master-craftsman and ceramicist, David Walters. David, a successful artist-entrepreneur himself, worked with me to create a performance platform and eventually the music festival in Franschhoek. Having someone on the ground in Franschhoek connected me with the crucial contacts – venues, sponsors etc. I feel very much part of the community now. The Franschhoek Classic Music Festival was started in 2004 and is one of a series of concerts and music weekends I manage there through the year. The (now Witness) Hilton Arts Festival has been running for a number of years. When was the classical concert series introduced for the first time? Subsequent to two solo performances on the fringe at the Hilton Festival I approached festival director Sue Clarence about the possibility of linking a series of concerts in the greater Hilton area to the festival. Her immediate response was that they would welcome me as part of the festival and handed over a venue for the festival weekend, the Hilton College Chapel. I was invited to envision and engineer whatever I thought would work as part of the biggest arts festival in the region. I now present the Music Revival Concert Series as part of the annual Witness Hilton Arts Festival with 10 to 12 concerts over the weekend. Where does your personal musical development fit into your busy schedule as producer and impresario? Do you still maintain a rigorous practice schedule? I practice on demand. I am fortunate in that I don't teach at all. I divide my time between liaising with artists, venues and other infrastructural components, writing press releases and publicity material, a substantial amount of design work for posters and programmes which I enjoy, and practicing on my own or rehearsing with other musicians to present the concerts. Once a programme is up and running I try to repeat it in as many performances and circumstance as possible. A number of these projects accumulate in a festival weekend. Performances also take place in my own home so the final performance day can involve a lot of activity that doesn't involve a piano! [I find cleaning a very rewarding activity as, unlike piano practicing, at the end of it you can visibility see what you have achieved!]. Practicing at any point in time includes revising works from an extensive repertoire (which I fortunately seem to retain and access quite easily) as well as fine tuning and gearing up for the next performance. I am also constantly extending my repertoire with new works, which I love exploring, as I choose to programme them. That is one of the unique and hugely positive aspects of what I do in that I can choose exactly what and when I wish to play as I am responsible for the production of each concert. Preparing for concerto performances, when the invitation arises, requires intense and rigorous preparation. You are a graduate of the University of KwaZulu-Natal and also the prestigious Royal Northern College of Music in Manchester in the UK. What has been your international exposure and did you ever consider a more permanent move abroad? I was fortunate to receive an invitation to study at the Royal Northern with Brazilian virtuoso and Liszt specialist Arnaldo Cohen, assisted by scholarships and bursaries from UCT and UNISA. It was a wonderful opportunity. From him I gained first hand knowledge that showed me for the first time, quite literally, how to really play the piano. I have returned to the UK several times to perform in various London venues and the Edinburgh Festival at the invitation of the Royal Overseas League (ROSL). But there are some many fine pianists in that 'big pond' I prefer to focus my activities locally where I feel I have an impactful role to play. I don't see that an audience in an outlying community of KZN is going to any less important or interesting to perform for than one in a big city like London. And I would certainly prefer to live here! You managed more than 30 performances, from Hilton to Franschhoek and Grahamstown, of Celebrating Chopin, a recital programme marking the 200th anniversary of Frederic Chopin's birth, last year. Do you have any similar project planned for this year? The Celebrating Chopin project was an amazing experience for me being able to play the same programme so many times; a real luxury. I played almost nothing but Chopin recitals for six months and it was incredible to note how the musical and technical aspects of the music became increasingly spontaneous and more fluent without extraneous distraction. I absorbed more and more of the nuances with each performance. Each composer has a different technique, sound world and head space and I felt that by the end of it that Chopin and I were good friends. Trying to avoid successful formulas I was reluctant to embark on another 'single composer' focus. But this year's 200th anniversary of Franz Liszt's birth in 1811 is too much of a milestone opportunity to miss. This is a big piano moment. So I will be playing a number of all Liszt programmes in various centers titled 'Liszt vs. Liszt' the title referring to the varied nature of his output, in genre, style and content, while playing on the uniquely mixed reception he still receives. What, to you, constitutes the ultimate performance - piece, orchestra, venue, occasion? The purely musical elements of an ideal acoustic, a great piano (I try to travel with one of my own pianos wherever possible) go a long way to that 'ultimate performance' but crucially, having an attentive audience is a gift. Music that really speaks to me, and my conviction, that it will speak to the audience (that's the risk) is essential for it to be a winner. Sometimes all these elements align in surprising ways. A recent Chopin performance at a restaurant in the KZN Midlands was magical. In the perfect acoustic of a simple barn-like building, a content audience who had wined and dined, observed a chilled winter afternoon sunset through huge windows behind me while I played. All this proved to very memorable occasion in the absolute silence of this rural setting. Also, a recent concert of orchestral show pieces we produced with the KwaZulu-Natal Philharmonic Orchestra in the historic Pietermaritzburg City Hall, including the Shostakovich Piano Concerto no 2, proved to be quite a challenging surprise, and meaningful one, for much of the audience. Please share some programme notes for your upcoming performance of Beethoven's Emperor with the KZNPO? It's a big work. The title is actually quite fitting and I guess that's why it has remained. As one conductor said to me "It's a symphony for orchestra and piano". Beethoven abandons the virtuoso style of piano writing of the previous concertos for a more integrated model where the piano blends with the orchestral texture, coming in and out of focus. It is not mere orchestral accompanying of the solo piano part. The difficulty is being ready to adapt, on the spur of the moment, to the orchestral line. One has to conceive this on your own before hand. Two weeks worth of rehearsal would be lovely, but we all know that doesn't happen! It is a big, open-hearted piece with confident expression that provides opportunity for the pianist to ride amidst the waves of the orchestral sonority in a way that I think no other concerto offers. For details of Christopher Duigan's performance schedule for 2011, visit http://www.christopherduigan.com or consult the What's On calendar.